Fasting is difficult and there can be health complications. You have to replenish the body after a day of fasting. One great way to break the fast is date & cashew nut juice. Make sure you fill your body with energy after fasting for a day. Fasting is difficult and there can be health complications if you don’t provide body the nutrients it needs. So, you have to be careful with what to eat during the pre-dawn and dusk meals to replenish the body after a day of fasting. Fasting can leave you parched and cause minor health troubles to signal the need for nutrition. In such a scenario, you can take help of these healthful food options. Date & cashew nut juice: One of the great ways to break the fast is with a glass of date and cashew nut juice. 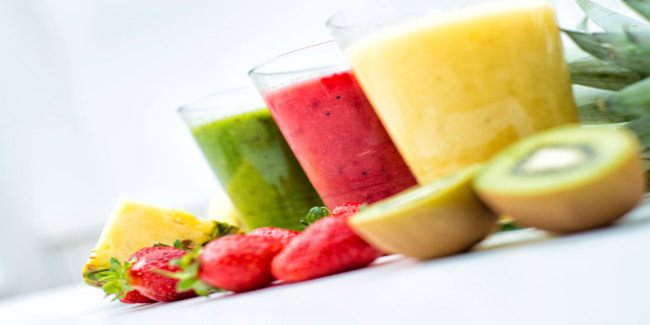 The fruit-based nutritious drink restores all the nutrients that you lose during the long fasting period. Moreover, dates provide a burst of energy. To make it, blend together cashew, sugar, dates (remove seeds) and cold milk in a blender. Apple, bananas and cashew nut juice: To prepare this juice, you need 2 sliced bananas, 1 chopped apple, 1 tsp of crushed cashew nut and 2 cupfuls of milk. Blend all these ingredients together and serve after chilling. The fruit juice has a revitalising effect besides rehydration. Orange, grape and lemon juice: This recipe is one of the best things to fill your body with energy after fasting for a day. The ingredients you require are 2 cupfuls of orange juice, 2 cupfuls of grapefruit juice, ½ cupful of lemon juice, sugar and 2 cupfuls of water. Combine the ingredients and blend for 2 minutes. You can use ice cubes, a few mint leaves and orange/lemon slices to garnish. Apart from providing lots of nutrients, this juice replaces lost salts. Make sure that your food during the fasting period is not too different from your normal diet. It should comprise all the major food groups – fruits and vegetables, bread, cereals and potatoes, milk and dairy foods and foods containing fat, proteins and sugar. Foods with complex carbohydrates such as wheat, oats, beans and lentils release energy slowly during the long hours of fasting. Fibre-rich foods such as cereals, whole wheat, potatoes and fruits also get digested slowly. Foods with refined carbohydrates, fatty foods and other fast-burning and heavily processed foods should be avoided. Caffeine, a diuretic that stimulates faster water loss through urination, should be avoided. Read more articles on Festival Fever.